I’ve been teaching yoga for around twenty years and I work at a place named after the Eight Limbs of the Yoga Sutras of Patanjali (compiled around 400 CE). The Yoga Sutras are basically a very practical (and surprisingly still applicable) guide on how to become a full expression of your most delicious and authentic self, that part of you that is continually pecking at the inside of your shell, ready to break free from your self inflicted limits as soon as you stop making excuses for why you can’t. Because of my profession and because of my place of employment and because I am forever a student of yoga/life, I revisit the wisdom offered in the Yoga Sutras often, and every time I come back to them I learn something new about myself. It’s true what they say about the layers of the onion, you can just keep peeling away to get to the next even more tender and translucent parts (of yourself). Right now I’m still really excited by the very first limb–which is called Yama–and details ethical principles that allow us to have healthy and positive relationships. Not only that, I’m still stuck on the very first piece of the very first limb (there are five Yamas), which is Ahimsa, or nonharming (in word, thought, or deed). You might think I’m a slow learner, and yet these sutras are dense–like pumpernickel bread–they take a lot of chewing to release their nutrients. This is not a quick-fix Self Help Recipe in Eight Easy Steps! Ahimsa. Do no harm. Sounds very nice, but what would it even look like to live a life based on non-harming? If you take it too literally, as sometimes happens with ancient texts, you will find yourself stuck in a trap. There is really no way to even just be alive without doing harm. You eat, right? Even if you’re a staunch vegan you still probably eat food that’s been brought to you from somewhere else, using fossil fuels, possibly running over wildlife as it gets trucked through the night by sleepy eyed truckers high on talk radio… (And, well, what about the peach itself? How do you think it feels to be bitten into like that? Ouch!) And every time you speak or act there’s a chance that someone might interpret your words or actions in a harmful way, even if your intentions are purely good. What about surgeons and soldiers and parents??? They continually have to make choices that seem to cause harm in the moment, in the hopes that as a result of their actions the benefit will outweigh the cost. As you can see, it’s impossible to live without doing any harm, and there’s really nothing we can do about it. Yet what we can do is open our eyes to the effects we have on our world and try to make choices that minimize the harm we cause. “This is so hard,” you may think. “Where do I even start?” Here’s the part that’s got me singing from the rooftops. It starts right Now, and right Here, and anyone can do it. It starts Inside. It starts with how we treat Ourselves! 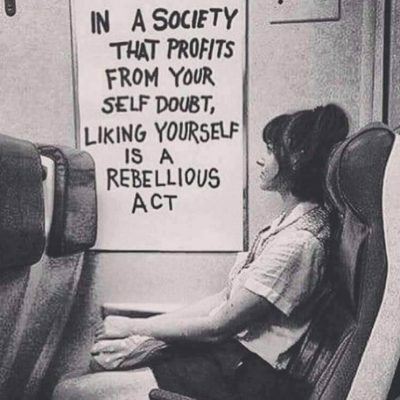 Not in how we treat the cute little furry animals and our neighbors/relatives or those less fortunate than ourselves (although of course that’s important too), but with how we treat our own imperfect selves. This is where the self compassion piece comes in. This is the advanced yoga. Getting both your legs behind your head is a piece of cake compared to this! How can we learn to be kind to our very own selves in word, thought, and deed? It takes practice, just like any difficult undertaking. The first step is to become aware, to practice mindfulness around our inner self talk, our private conversations that no one else hears. What if we spoke to others in the way we speak to ourselves? Would you still have very many friends? If you are married now, would you still be? Or would you be in jail? Honestly, most of us are pretty mean to ourselves. As soon as we become mindful of our ongoing critical inner dialog we can begin to upgrade our data, replace self flagellating outdated negative files with new more friendly, helpful and life affirming ones. We can stop waiting for someone else to come along to save us from this mess and become our own best friend, ally and advocate. – without burning out, without resentment, and from a stable place of healthy balance. 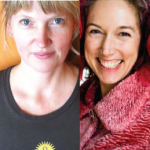 For more info on Self Compassion check out the following workshop with Ashley Dahl and Tracy Hodgeman (see photo at left): Self-Compassion, a Radical Path. Tracy also teaches at 8 Limbs Capitol Hill (Weds/Fri 12:15-1:15 Yoga Tune-Up), Phinney Ridge (Fridays 6:30am All Levels Flow and 9am All Levels) and West Seattle (Thursdays 5:45pm Level I, Saturdays 9am Level II and 10:45am Level I).